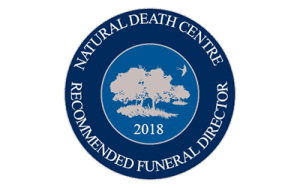 At Natural Endings we can arrange a non-religious funeral that reflects your loved ones unique personality and life. Not everyone feels in tune with a religious faith. In these cases we introduce you to a humanist celebrant or civil funeral leader. We work with a few different funeral leaders and once we have found out a bit about you we will pair you with the most appropriate. When planning a funeral the humanist officiant will speak to you and your family about the person that has died. Usually they’ll visit you at home. It is helpful for the officiant to learn as much as possible about the person who has died, so that the funeral tribute really captures their life and personality. These types of funeral concentrate very much on the person that has died, their life, their achievements, their interests and passions and their relationships. A funeral can be a very spiritual occasion even if there is no particular named faith. Some families might not attend church often but might want an element of a faith such as a prayer. We also work with some ministers who are very helpful and who are willing to include as much or as little faith as is needed. They derive the funeral by the wishes, values and beliefs of the deceased and their family. Other individuals may feel very in tune with a faith but do not practice it. We have included Pagan, Buddhist and Hindu references in funeral services. Other people might feel that there are cultural links that are integral to that persons identity. There are always ways of including these things within a ceremony. We are also happy to advise and support families that would like to lead their own ceremonies or write a eulogy or tribute. Some families that we have worked with have felt no need to have a formal ceremony at all. They have simply wanted to sit and listen to music, to share memories in a very informal way or even to have their own memories in silence. We are here to help and can arrange whatever you want. Whatever your choices the ceremony will be unique and reflect that individual’s personality and celebrate and reflect upon the time that you have had together. Tributes. These can either be written by the funeral leader after meeting with you and finding out about the person that has died. Or they can be written by friends and family and read out by those people or by the funeral leader. Funeral Poems and Readings. We have lots of lovely poems and readings that we can suggest. Or you might know of something yourselves. Silence. Silent reflection for personal thoughts or for a silent prayer for those with a faith. Small rituals like flower laying (or individual flowers, candle lighting, lantern lighting, or dove or balloon releases). Or you might have some ideas yourself. There are no rules. None religious funerals can be held in a number of locations. Obviously many are held in crematoriums, municipal burial chapels or beside the grave. There are other options too. We have arranged ceremonies with the coffin present in many unusual locations: families own homes and gardens, barns, a youth hostel, marquees, hotel function rooms and even a pub. We also have permission to use a stately home, a beautiful tiled swimming baths and City Stadium for MCFC football funerals. Alternatively you might have somewhere in mind yourself that is appropriate because you have had happy times there with your loved one. If you have had a bereavement and would like to talk to someone about funeral arrangements please telephone our 24 hour number 0161 969 6690. Or email us at enquiries@naturalendings.co.uk.